Designed to fit in the tightest places, our exclusive Elfa Laundry Storage has plenty of room for detergent, stain remover, fabric softener and more. Available only at The Container Store, this solution includes two 2-Runner Drawers, one 3-Runner Drawer, a Melamine Top and Back Stop Pins. The fine weave of the mesh prevents small items from falling through. We offer a variety of Drawer Accessories (including liners) that you can add to customize your solution. Elfa is an entirely customizable system - if this isn't exactly the solution you're looking for, try our Elfa Drawer Planner. Platinum Elfa Mesh Laundry Storage is rated 4.8 out of 5 by 19. Rated 5 out of 5 by BarbaraAnne from Love it! Quality product, company is great to work with, couldn't be happier with my purchase! Rated 5 out of 5 by Rubybass from So happy that I bought these shelves! I ordered two more of the same plus a laundry sorter, couldn't be happier. Easy to assemble, pretty and functional. Now I'll go back for my kitchen and office space. These products are the best I have bought the brand is ELFA. Rated 5 out of 5 by RobbieOK from Great Product As usual, Elfa is everything it promises. It is exactly what I needed in my laundry room. I first bought another similar item (another brand) which was absolutely worthless. I threw it away. This one is well made and does what it is supposed to do. Rated 5 out of 5 by campingqueen from These are slim enough to fit in my Camper closet I have this deep, slim closet in my camper that I needed to find a set of drawers for. 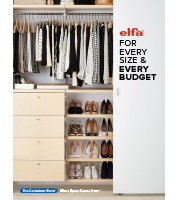 I looked through the elfa storage and realized that you can customize it to however many drawers you want. I have three drawers with stops and one small drawer on top for misc. items for camping - cameras, hats, etc. I love this system! Rated 4 out of 5 by SEWatHome from Sturdy and compact I purchased this not knowing if it would be sturdy enough to hold a heavy bottle of liquid detergent on anything other than the bottom drawer. I was pleasantly surprised to find that I can put the laundry detergent in the top drawer if I don't use the cover that comes with the unit. So far I am pleased with the product sturdiness and usability. Rated 5 out of 5 by rico from Just what I need in my lanudry room I have a very small lanudry room. The Elfa Mesh Lanudry Storage unit we bought was just perfect and it fits in the middle of my washer and dryer. You have lots of drawer room to store all your items. I highly recommend. Rated 4 out of 5 by prettysmartchic from Love it... just what I needed I needed a slim laundry/utility cart that could hold heavy things like detergent, and customizable shelving was a plus. I bought this and am very pleased. It's very sturdy, holds all my detergents and general household cleaning supplies, and it really just makes the job easier. One thing I did not here -- I put the entire system on Elfa. Putting all those heavy detergents into a small closet means constant pulling and pushing the cart... The casters are great but they are non locking. Rated 4 out of 5 by Jule from Very nice laundry storage! I bought this to go between my washer and dryer and it fits perfect! The top appears silver/gray in color but it came as a dark gray/walnut color. Not a horrible color but I would have liked the lighter color to match my new Maytag silver gray appliances. Very easy to put together--about 10 minutes. Make sure you put in the back stop pins in the top rail before you put the top support bars in. I did not and had to remove the top support bars and then put the pin stops in and replace the support bars. They slide in very easy and it all looks organized. The only bad part was the melamine top came chipped in a small spot, but I just flipped it over and it's hidden underneath where no one can see it. Nice set and I would definitely buy from the Container Store again. Rated 5 out of 5 by Precious from Actual LAUNDRY Storage I use this as my hamper in the corner of my closet. Great space-saver and it is amazing how many clothes these drawers can hold. The drawers slide nicely and it's a sturdy piece. Rated 5 out of 5 by ContainerStoreShopper from Great For The Laundry Supplies I was skeptical about purchasing this item, but I absolutely love it. It is the perfect size for your immediate laundry supplies. It fits perfectly next to the washing machine!!! Love it! Rated 5 out of 5 by Nolefan96 from Laundry Room Storage Upgrade Added the laundry storage stack and some elfa shelves above our laundry sink. Storage stack is sturdy and drawers glide in and out even full with laundry detergent. Love how elfa has made our laundry room more functional and organized! Rated 5 out of 5 by DreamcatcherKwe from Love these drawers These are sturdy and beautiful and functional. They are quickly assembled and do the job wonderfully. I want to buy twenty more of them and would if I could find uses for them! Rated 5 out of 5 by Dlwvmills from Closet Design Plan After looking for a solution to an under utilized closet, I was directed to an Elfa in store demo. After the demo,I talked with an associate who helped me design the space. He saved and printed the priced design so that I was able to bring it home to verify deminsions. Then from the comfort of my home after I validated that this was the design I wanted, I placed and paid for my order online and scheduled a pick time. YEA!!!! This is wonderful, and I know that once my solution is installed I will even be more thrilled with my purchase. Rated 5 out of 5 by Barbara61 from Great Purchase! I purchased this item because the one I had purchased from a local major vendor kept falling over in the laundry room when I pulled it out to add items. This product does not have to be pulled out because the drawers pull out so easily. This product is very sturdy and I would highly recommend it! It is also easy to assemble. Rated 5 out of 5 by Murphy from Great purchase! The laundry storage unit looks better than in the picture! It fits the space between my washer and dryer perfectly, and the drawer height is just right for large laundry detergent bottles. I'm very happy with my purchase. I did purchase the optional drawer stops, and I'm glad I did. They prevent the drawers from being pulled out of the unit. With the heavy detergent bottles, that could have been a problem. The only thing I am not pleased with is that I ordered this as a unit, but it was shipped in piece parts, and I couldn't assemble it until I received the last of the piece parts. There was about a 2-week lag between getting the first parts and the last ones. I would have preferred that it ship as a complete kit. Can I put caster wheels on them? Casters are available (sold separately, listed below) for our elfa Mesh Laundry Storage. What is the unboxed weight? The unboxed weight of our Elfa Mesh Laundry Storage is approximately 18-1/2 pounds. Our product dimensions are listed on the left side of the page in the Item column. This drawer unit measures 10&quot; wide x 21&quot; deep x 29-5/8&quot; high. I want to use this in a broom closet...can 2 of these units be stacked on top of each other? how would this do holding heavier veggies like sweet potatoes and spaghetti squash if I put them in the two runner drawer? Our elfa Mesh Laundry Storage solution can accommodate up to about ten pounds of evenly distributed weight per drawer.